Morgana was a healthy dog her whole long life. 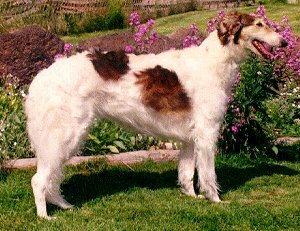 She had a chunky, muscular build not unlike a track greyhound and had the lovely, effortless long sidegait of the Zephyr's Reach dogs. Morgana was a keen dog with a beautiful tail and big, dark eyes set well in a narrow backskull. 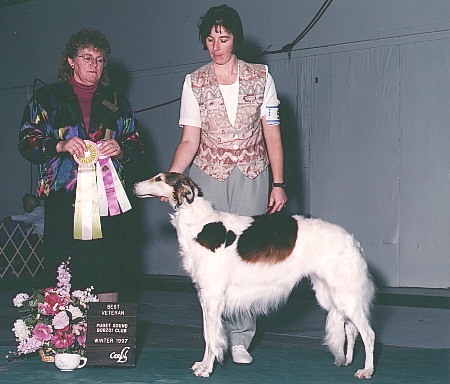 She was known to lie to get her own way :-) and produced one litter sired by Ch Zephyr's Reach Magic Mirth, LCM, CC, CM (the first champion dog with those running titles). I wish she could have had another litter. An emergency spay when her pups were ten days old saved her life but ended her motherhood career. I still see traces of her in her pups and grandpups. The keenness when sighting prey, the dancing on the toes trot when showing off, the love of all food, the long tails and wide butts, and the eyes, the soft expression and eagerness to run. 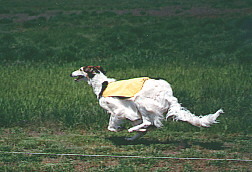 I was lucky to get one of John Cowan's best dogs. May all my dogs be as beautiful, sound, and healthy as Morgana.